The Truckee swim team’s stellar all-around performance at the Zephyr League Championships last week was by no means a fluke. The Wolverines proved as much at the Northern Division I-A Regional Championships in Minden this past Friday and Saturday, as their boys and girls teams again swept the top spots while more than a dozen swimmers qualified for state individually with a top-four finish. All six relay teams advanced with first- or second-place finishes. With such a fine showing across the board — the Wolverines tallied 30 top-four finishes in total — the Truckee boys claimed the regional title with 371.5 points to runner-up Sage Ridge’s 212. South Tahoe was third with 190.5 points, followed by Fernley (189), Lowry (183), Fallon (146), Sparks (95) and Incline (31). The girls won with 361 points to runner-up South Tahoe’s 304. Fallon came in third with 257 points and was trailed by Lowry (150), Sage Ridge (131), Incline (82), Fernley (74) and Sparks (22). 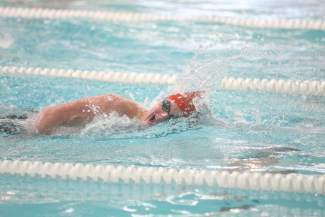 After advancing past the trials round on Friday, which required a top-eight finish, Truckee’s Marcus Rodarte captured wins in two individual races — the 100-yard backstroke and the 100 freestyle — while also helping lead the boys 200 medley and 200 freestyle relay teams to first-place finishes. Both relay squads were made up of Marcus Rodarte, brother Kaleb Rodarte, Alex Straw and Jake Hamilton. Brittany Percin and Brittney Straw also won two events individually, with Percin winning the 200 and 500 free, and Straw winning the 100 butterfly and 100 breaststroke. Both also were members of the winning girls 200 medley relay along with Niki Kates and Ingrid Suter. Other individuals earning first-place finishes were Alex Straw (100 breaststroke), Kaleb Rodarte (100 butterfly) and Kates (100 backstroke), while a whole crew of Wolverines punched their tickets to state with top-four finishes, many in multiple events. The Division I-A state championship is scheduled for Saturday at the Carson Aquatic Facility in Carson City.